Magnitude 7.0 Earthquake Shakes Alaska, Damaging Roads, Buildings The earthquake, with its epicenter just a few miles off Anchorage, has been followed by a series of aftershocks. The Trans Alaska Pipeline System has been shut down. After an earthquake on Friday, a car is trapped in a crumbled section of an off-ramp from Minnesota Drive, a major road in Anchorage, Alaska. In Anchorage, Alaska, people took refuge under tables and fled outdoors on Friday morning, as a magnitude 7.0 earthquake struck just north of the city. Some roads, bridges and buildings have been damaged, and some businesses shuttered for the day. Schools were evacuated and parents told to pick up their children — a challenge, in some cases, given the traffic jams that quickly formed across the city. Alaska Gov. Bill Walker has issued a declaration of disaster. Anchorage police report "major infrastructure damage." "Many homes and buildings are damaged," the police department says. "Many roads and bridges are closed." A tsunami warning was temporarily issued for coastal regions of Cook Inlet and the Southern Kenai Peninsula, but it has since been canceled. The earthquake struck just before 8:30 a.m. local time (12:29 p.m. ET). The epicenter was about 8 miles north of Anchorage, at a depth of some 25 miles. It was followed by a series of aftershocks, including one particularly powerful one. "People went back inside after the first earthquake struck, but the 5.8 aftershock about five minutes later sent them running back into the streets," The Associated Press reports. The original earthquake powerfully shook Anchorage, the most populous city in Alaska. "I've been here 11 years and I've felt movers before, but that scared me s***less," Anchorage resident Kevin Bartley told reporter Nat Herz of Alaska Public Media. "That's the quickest I've ever seen one come on and the hardest I've ever seen it shake. "The transformers were blowing up. ... It felt like for a minute we might watch that ground open up," Bartley said. Kari Tai, who is visiting Anchorage, was in her brother's house when the earthquake began. "It seemed like it lasted well over a minute (even accounting for the misperception of time in nightmares)," she tells NPR. "We continue to feel aftershocks but are lucky to have power." The United States Geological Survey estimates that there is a low probability of fatalities, since most people in the region live in buildings that can withstand an earthquake. Some economic damage is possible, though, the USGS says. So far, there have been no reports of deaths or serious injuries. 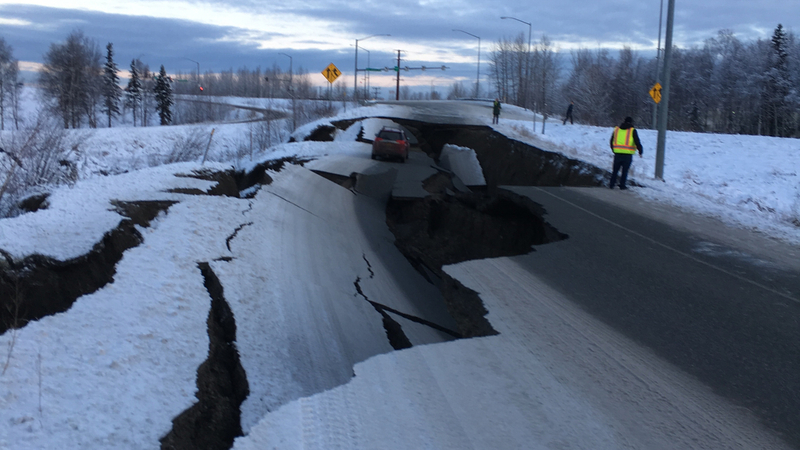 An off-ramp from Minnesota Avenue, a major thoroughfare, was damaged; the portion of road provides access to Anchorage International Airport. A vehicle was left standing on an island of asphalt in the middle of the road, with gaping chasms on all sides. Chris Riekena, a motorist behind the stranded car, saw it happen. It happened slowly, he said, not abruptly. As far as he could tell, the driver of the vehicle — after discussing the situation with police — left his stranded car behind and continued to the airport. While some ramps to the airport are closed, the terminal is open, and flights are arriving and departing, the airport announced on Twitter. However, the Federal Aviation Administration says it has issued a ground stop, and it is not clear when flights into Anchorage will resume. The Trans Alaska Pipeline System has been shut down in the aftermath of the quake, and crews are assessing possible damage. Alaska is the most seismically active region of the United States. Since 1900, the state has experienced one magnitude 7 to 8 quake every year, and six magnitude 6 to 7 quakes annually, according to the Alaska Seismic Hazards Safety Commission. And counting the smallest quakes, the state experiences more than 1,000 earthquakes per month. In 1964, southern Alaska experienced the most powerful earthquake known to hit North America — a 9.2 magnitude quake, with an epicenter about 75 miles east of Anchorage. A previous version of this story described the 1964 earthquake in Alaska as the largest known to hit the Western Hemisphere; in fact, it was the largest in North American history.